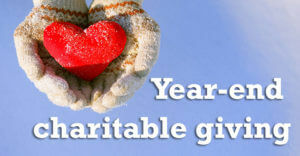 Charitable contributions have been a long-standing tax strategy as long as you itemize and your gift qualifies. Did you know you can receive an additional tax benefit if you donate long-term appreciated stock instead of cash to your favorite charity? 2) You can avoid the capital gains tax you’d pay if you sold the stock. Donating appreciated stock can be especially beneficial to taxpayers facing the 3.8 percent net investment income tax (NIIT) or the top 20 percent long-term capital gains rate this year. Let’s say you donate $10,000 of stock for which you paid $3,000, your ordinary-income tax rate is 37 percent and your long-term capital gains rate is 20 percent. And let’s say you itemize deductions. If you sold the stock, you’d pay $1,400 in tax on the $7,000 gain. If you were also subject to the 3.8 percent NIIT, you’d pay another $266 in NIIT. Instead by donating the stock to charity, you save $5,366 in federal tax ($1,666 in capital gains tax and NIIT plus $3,700 from the $10,000 income tax deduction). If you donated $10,000 in cash, your federal tax savings would be only $3,700. Second, beware that donations of long-term capital gains property are subject to tighter deduction limits — 30 percent of your adjusted gross income for gifts to public charities, 20 percent for gifts to non-operating private foundations (compared to 60 percent and 30 percent, respectively, for cash donations). For charitably inclined taxpayers who own appreciated stock and who’ll have enough itemized deductions to benefit from itemizing on their 2018 tax returns, donating the stock to charity can be an excellent year-end tax planning strategy. This is especially true if the stock is highly appreciated and you’d like to sell it but are worried about the tax liability. Ciuni & Panichi professionals have been helping businesses and individuals plan for the best possible tax outcome for 45 years. To learn how we can help your business and you contact Nick Leacoma, CPA, Tax Department Senior Manager, at 216-831-7171 or by email here.